Chicago Teachers Union President Karen Lewis said the CPS proposal would have divided the union. RIVER NORTH — A 40-member bargaining committee with the Chicago Teachers Union unanimously rejected what was termed a "serious offer" from Chicago Public Schools on a new contract Monday, saying teachers "do not believe" the district will honor its promises to "stabilize" finances. Saying first that teachers "have already given" enough, President Karen Lewis added, "The cuts they've asked for will not solve the problem." She cited a "lack of trust in CPS" and the district's "weasel language" in previous contract talks. She specifically said the district's pledge to halt the expansion of charter schools was disingenuous, as the Illinois State Charter School Commission could overrule it and allow more Chicago charters. CPS Chief Executive Officer Forrest Claypool insists the district was giving the union much of what it wanted. Lewis basically dared CPS Chief Executive Officer Forrest Claypool to impose threatened layoffs, saying increased class sizes would prompt a public "outcry." Vice President Jesse Sharkey said that, with a 105-day fact-finding process beginning Monday in stalled talks, the earliest teachers could go on strike would be May 23. In the meantime, Lewis said, "we'll have to" return to the bargaining table. 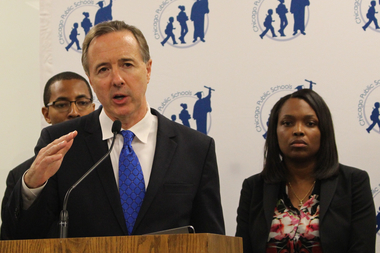 "While we are disappointed by today’s result, CPS remains committed to reaching an agreement with our partners at the CTU that is in the best interest of our students, parents, teachers and city," Claypool responded in a statement. "We are committed to returning to the bargaining table and working around the clock to reach an agreement. As we continue to bargain, we must move forward with plans that restore fiscal stability to the district." Sharkey countered: "The board cannot continue to balance its budget on teachers and students by cutting our compensation and eliminating vital education services such as special education." The union said the offer from CPS did not address the "difficult conditions in the schools, the lack of services to our neediest students or address the long-term fiscal crisis that threatens to gut public education in the city." Lewis said last week that the deal swaps "economic concessions in exchange for enforceable protections of education quality and job security." Sources said the CPS offer involved teachers picking up a 7 percent pension payment previously paid by the district, as well as teachers paying more for health benefits, while the district agreed to annual raises of about 3 percent a year, as well as a cap on charter schools and other concessions. Lewis has previously declared that the additional pension payment would amount to a 7 percent cut in take-home pay and called that a "strike-worthy" issue. The union said Monday it also included a demand for 2,200 retirements at the end of the current school year, another unappealing prospect for teachers. Claypool said Monday the deal included "pay raises, guaranteed job security and met the union's key demands, including restrictions on charter-school expansion, raises for seniority in addition to cost-of-living increases and more classroom autonomy for teachers." CPS said the pact included $200 million in increased revenue and raises for seniority and experience, as well as TIF, pension and charter provisions. The union wasn't buying it. 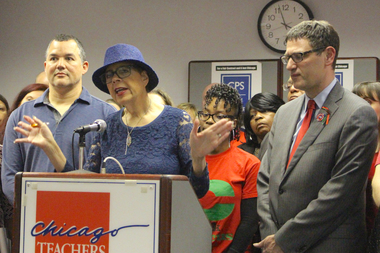 In a news conference at union headquarters in the Merchandise Mart, Lewis said the district keeps asking teachers to give more and more without fulfilling its own financial obligations, and that the deal did not address the "revenue-based problem" at CPS. The union recommended using Tax Increment Financing (TIF) money to fund schools or approving a "financial transaction tax" that would bring money to the city. The deal presented only guaranteed that money would come "out of our pockets," Lewis said. Lewis cited TIFs, a comprehensive bill on school funding in the General Assembly and the state's Charter School Commission as three areas where reforms could be made to show good faith to the union. The rejection of the proposal clears the way for an independent appointee to begin a "fact-finding" mission as to why negotiations haven't produced an agreement — a three-month-plus process beginning Monday that is one of the last hurdles before the union can formally declare a strike. Union membership has already voted overwhelmingly to approve a possible strike. Yet even if the fact-finding process begins, a strike couldn't begin until May at the earliest. The union, however, has also spoken of a delayed strike at the start of the next school year in the fall. Union spokeswoman Stephanie Gadlin said Friday the so-called Big Bargaining Team was made up of 40 "rank-and-file educators" including teachers, counselors, nurses, special-education professionals, social workers and clinicians. Representing the bargaining committee at Monday's news conference, teacher Monique Redeaux Smith said, "We have a moral responsibility to protect the interests of the students of Chicago." She said the group was "not convinced that [CPS] will make good" on promises made at the bargaining table. Lewis defended the group as representing the union's entire membership and said the offer threatened to pit teachers against themselves and other staffers. "We're not gonna pit the paraprofessionals against history teachers," she said. "I refuse to believe that dividing the union would be a good thing." The union "believes strongly in the democratic process," Gadlin said. "And its leaders work on behalf of its rank-and-file." Claypool issued an optimistic statement last week when the offer was first announced, saying, "As the CTU leadership said, CPS has put a serious offer on the table that would prevent midyear teacher layoffs." He called it "a true compromise that requires sacrifices from both sides so that we can protect what is most important: the gains our students are making in their classrooms." Claypool added, "We will continue to work around the clock to reach consensus on an agreement that is the best interests of our students, educators and parents."